In post on a "straight" tank. In is for your CO2 fitting, and OUT is for your syrup. In and out are also on the fittings to help you avoid mistakes replacing a tank. 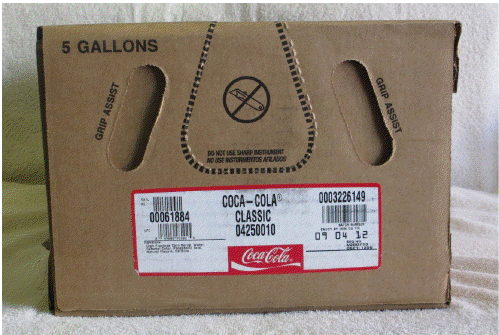 Coca Cola 5 gallon Bag in Box. 11 3/4 inches wide, 8 1/2 inches tall, 15 1/2 inches deep. Coca Cola brand product in 2.5 gallon form. Box measures 11 3/4 inches wide, 4 1/2 inches high, 13 inches deep. This is an enjoy by date-NOT an expiration date. Please call us for a letter from Coca Cola explaining what this means so you do not get erroneously fined by the NYC Board of Health. This is a production date from Lemon-x on their products, NOT an expiration date. You can call us to send you an authorized letter from Lemon-X to show the NYC Board of Health that this is not an expiration date. Examples of five gallon syrup tanks. They are 22 or 25 inches high. Lemon-X Growers Fancy Juices come in many flavors and also offer a 100% juice blend. Standard size is the three (3) gallon pictured here but 1.5 gallon is available in Apple Juice. Box dimensions are 9 1/2 high by 7 3/4 tall by 13 long. This is a premium 5 gallon Autotap brand syrup. The box dimensions are the same as the 5 gallon Coke products.